RAGENHEART's debut is for those who appreciate remarkable melodies with usually quite a dark and epic mood, fantastic singer with great emotion and range and excellent performance by every musician, topped with clean and solid production. Their music is intense, versatile, mysterious and truly captivating - heavy/power metal with some progressive metal and hard rock touches in the vein of CONCEPTION, RAINBOW, MAGNITUDE 9, DIO, EVERGREY, HEIR APPARENT, CRIMSON GLORY, WHITESNAKE, IRON MAIDEN, GARGOYLE... The Greeks took these influences and created a unique album, traditional, yet fresh sounding. 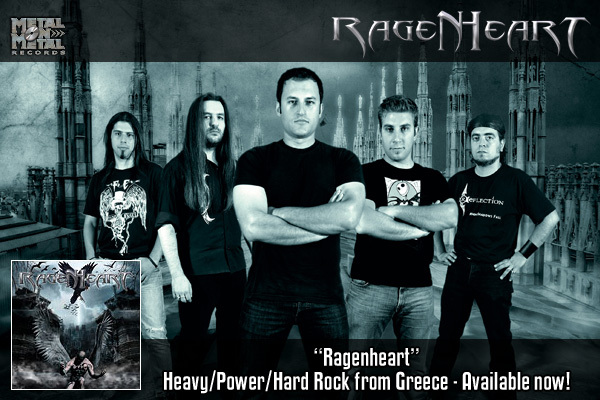 RAGENHEART was formed in early 2002 by Angel (guitars) and John Koroneos (vocals) in Athens, Greece. They spent several years composing and trying to establish a stable line-up until 2005, when the arrival of three highly skilled musicians: Nikos Michalakakos (bass, SPITFIRE), Stavros (keyboards) and Nick “Speedy” (drums) gave an important boost to the band’s potential. 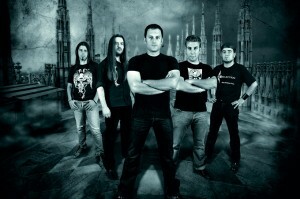 In 2006 RAGENHEART recorded a demo titled “In The Name Of God” and managed to sell almost 700 copies in countries such as Greece, Germany, Italy, France and Japan. The demo received great reviews and ratings in well-known magazines worldwide, such as Greek "Metal Hammer" (7/10), German "Heavy" (4/5), British "Terrorizer" (Greek metal special article) and many webzines and fanzines. The band combines a few styles from a wide range of influences - heavy, power and progressive metal as well as some hard rock - reflecting in various moods of the songs. Several promoters chose RAGENHEART as an opening act for numerous great heavy metal bands (such as HEIR APPARENT, LEATHERWOLF, OMEN and CLOVEN HOOF) and the band earned their reputation as a solid live act. In late 2007 RAGENHEART began recording their full length album for Burning Star Records. During the process however the label experienced problems and set all the bands, that had not released anything by that time, free from their contracts. This fact did not stop the band; they continued recording, new songs as well as all the songs from the demo. When the process was over after a longer break in 2009, they started to search for another record label. The search ended in the beginning of 2010 when Metal On Metal Records, impressed by the remarkable quality of their music and production, offered RAGENHEART a deal for releasing their self-titled debut CD in April 2010. Those who appreciate great melodies with usually quite a dark and epic mood, fantastic singer with great emotion and range and excellent performance by every musician, topped with clean and solid production, will not want to miss "Ragenheart"! It's intense and truly captivating - heavy/power metal (with some prog metal and hard rock touches) at its best!